Things are warming up nicely on the game fishing front at the moment that’s for sure with 19-20 degree water pushing down from the north and bringing some nice fish with it! We fished Head Hunter on Saturday and had an excellent day, after a slow morning starting straight out the front of Bermagui chasing Albacore we were listening to a couple of boats on the radio up north at mourya canyons who were getting yellowfin we elected to head wider & north. We were rewarded with our decision and managed to find a nice patch of yellowfin tuna at 36°20 150°30 we kept one around the 20kg mark and released another, we were able to watch them chasing flying fish at theres nothing better than watching yellowfin jumping about trying to catch a feed for themselves. As the afternoon progressed we hooked into a nice one for young Andre, after nearly a two hour battle on 15kg line and fighting the fish into the dark the hook pulled with about 20meters to go. Safe to say we weren’t real happy but thats fishing! Although we certainly didn’t set any records on the amount of yellowfin caught in one day it certainly one I will remember for awhile. To be able to watch these awesome fish chasing flying fish around on the surface, having them jump through the spread of lures and all around the boat whilst your fighting fish is pretty special thats for sure. 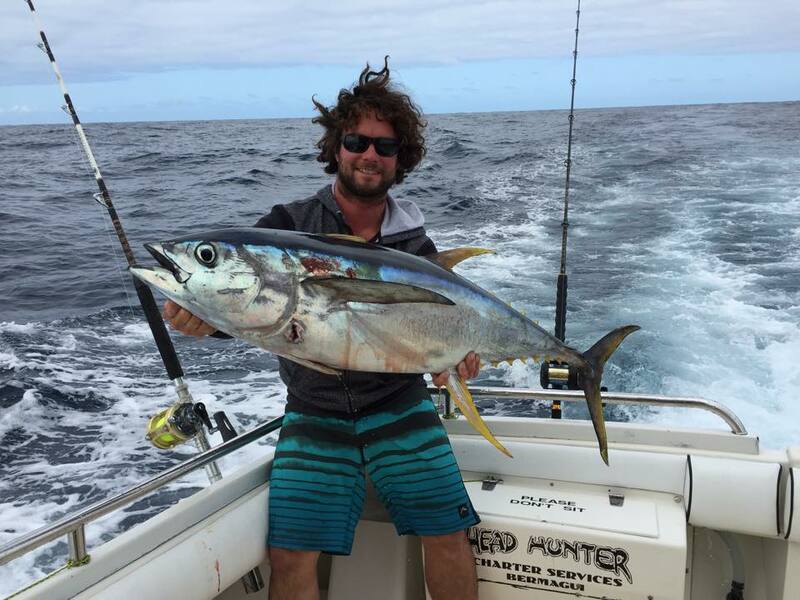 The fishing is looking like improving over the next few weeks with good numbers of yellowfin & albacore being caught the whole way up to Sydney, plus the odd striped marlin about to the north. I’d only expect things to get better of the next few weeks!